I needed something that would be quite fast but still provide enough ISA slots. This is a Supermicro P6SBA motherboard. 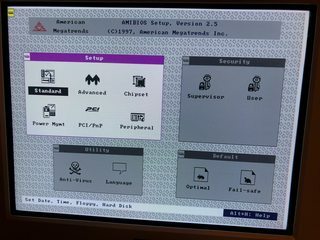 It's a pretty standard early 440BX board if not for on detail — it has AMIBIOS. Installed you can see a Pentium 3 500 MHz CPU. I do recommend updating its BIOS to the latest 3.1 version because without it the board has issues detecting ISA cards and managing resources. I wonder whether this board supports Coppermines because I do hope to find a 1 GHz Pentium 3 one day. It doesn't allow setting the FSB to 133 MHz though, but I don't want that. I've chosen InWin H500 as the case — it's my favourite. It's a desktop, but really big and really easy to work on. You can see it's almost too big for my case — I think only XT cases are bigger than this when it comes to desktop form factor. I always wanted to try an SLI configuration even if it's kind of pointless since I also have both Voodoo 3 3000 and a Voodoo 5 5500. However, it just seems cool to me. I did have in issue with the fact that I didn't have an SLI cable. I could never make one — the clips kept breaking on me. I tried ordering one from eBay, but that one turned out to be a faulty one. I got a refund and actually managed to make a working cable — even if it probably won't survive being pulled from the cards. Next came the AGP card. Originally the system came with a 3DLabs Permedia 2. It seemed cool to me, because it's almost a workstation card for an almost workstation motherboard. The only issue is that it doesn't seem to support graphic mode that the BIOS uses. I don't know how the previous owner used it, but I just couldn't make it work. There aren't any artifacts in games, but in Windows you can't even see the checkboxes, so it's pretty unusable. 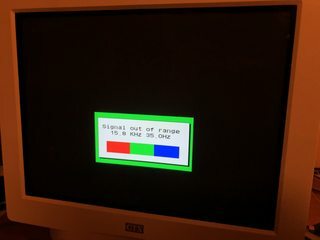 I've tried another module from my ATI Rage card, tried several drivers — nothing worked. In the end I probably could pick a faster Matrox card like a G550, but this will do for now. First, a Creative SoundBlaster 16, CT2230. Connected to it is a Roland SC-55. 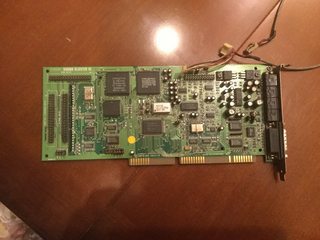 It's an almost bug-free card with a true OPL3, but there are some issues with games like Duke Nukem 3D (I get lags and missing MIDI notes due to bugs in MPU401). 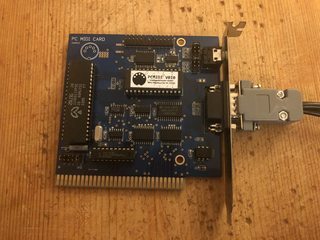 Next, keropi's wonderful MusicQuest clone card, a standalone MPU controller. Pentium 3 might seem like an odd choice for MT-32, but I have some games I want to play that aren't speed sensitive. I've just recently learned about the Ultimate Talkie Editions of Monkey Island 1 and 2 — it's so awesome to me that somebody actually got through the trouble of patching the original DOS games. And you really want a newer machine for that, because the games would be quite big for a 386 or even a 486. Another nice lifehack is that I've used a simple headphone jack splitter so that I could plug the output of both MT-32 and SC-55 into my SB16's line in. No mixer needed! I've also added a 3COM NIC card as I usually do. Which leaves me with one free slot that can be used for either an ISA card (like my Gravis PnP Pro or Yamaha SW60XG) or a PCI card (like SB Live, MX300 or even a DVD decoder card). I'm really happy with this build. It feels like a nice 1998/1999 transition system: it has a motherboard that combines really new features like AGP, USB and 100MHz FSB, but also great support for legacy hardware. It's what someone would have built back then if he had already heavily invested in DOS sound hardware. 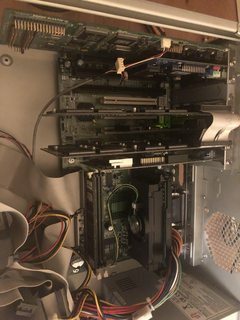 Also, this machine is pretty similar to a Pentium II@233/Nvidia Vanta system I used to play back in the day, but it's better in almost every way. You can see that for now I mostly play games that don't really need Glide or MIDI hardware, like Sanitarium, Blade Runner and LEGO Rock Raiders (it doesn't like Voodoo at all). Well, I will soon have the full holidays in front of me and I plan to play a bunch of Wing Commander Privateer, FreeSpace, Monkey Island, Forsaken and many other games. jheronimus wrote: Another nice lifehack is that I've used a simple headphone jack splitter so that I could plug the output of both MT-32 and SC-55 into my SB16's line in. No mixer needed! I've always heard that it's better to use a mixer rather than just splicing two signals together like that. Any noticeable degradation from going that? I've got my MT-32 and I'm currently looking for an SC-55 and I'll need to route them in a similar way or run the MT-32 through the SC-55. MrSmiley381 wrote: I've always heard that it's better to use a mixer rather than just splicing two signals together like that. Any noticeable degradation from going that? I've got my MT-32 and I'm currently looking for an SC-55 and I'll need to route them in a similar way or run the MT-32 through the SC-55. I might be mistaken, but your setup would be different from mine. I'm not using MIDI pass-through, so I don't need to have both modules turned on at the same time. SC-55 is connected to SB16, MT-32 is connected to MusicQuest. They share audio output connection, but not MIDI. Hence, I only have one MIDI module working at a time and I don't have any issues because there is always only one source of audio output. In your case it's pretty possible that you'll have both modules trying to play the notes that are being transferred through the MIDI cable, so you might have issues. Then again, I guess it could be as simple as muting the module you're not currently using. Oh, no, I meant sending the MT-32's L/R audio output through the SC-55's L/R audio input jacks. If I go that way then I'm pretty sure I have to have both powered on if I want to use the MT-32. On the other hand, I could go with your scenario and create a MIDI cacophony and just play that over the Resident Evil: Director's Cut Dual Shock Edition soundtrack with all my volume knobs turned to 11, subwoofer set to maximum bass, and wait for the neighbors to call the cops. But if I want to do that, I'll definitely need a mixer. All that goofiness aside, looks like you've got yourself a build that does what you want it to do. Love the horizontal case and Model M. What do you think is going to be your most played game on this guy? MrSmiley381 wrote: All that goofiness aside, looks like you've got yourself a build that does what you want it to do. Love the horizontal case and Model M. What do you think is going to be your most played game on this guy? Thanks! Well, I'm currently playing Sanitarium and Lego Rock Raiders most of all. I'm especially happy with the former because for some reason I couldn't run it on my previous P3 builds. Meanwhile it seems like I'm getting issues with DirectX games like X: Beyond The Frontier and the first Jedi Knight, I get weird colors and artifacts. I've reverted to reference Voodoo drivers already and I probably need to downgrade DirectX from version 7 to something like DX6. This issue is obvious in Lego Rock Raiders where I can switch between Matrox and Voodoo 2: the game runs fine on the former and looks weird on the latter. So either it's a software issue or I just need to change my Matrox card to something like Riva TNT2 or GeForce 2 and use it for all DirectX games. I also want to try other space sims like Privateer series, Freespace and Independence Day. I kind of want to get a proper USB joystick for it. Ideally — a Microsoft SideWinder Force Feedback 2, but that model has a cult-like status in sim community and tends to cost a lot. Pretty neat build, I've always had a soft spot for those desktop style cases, in a style that's similar to the first PC I had too. If you're getting those glitching textures in rock raiders on some walls / top of sealed areas, I have no idea how to solve it since it happened on pretty much everything I ran it on that ran Win9x. 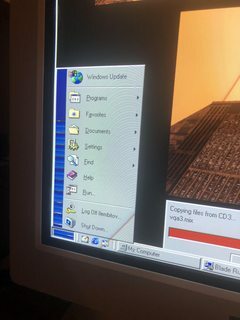 NT and XP solved it but had crashing problems instead..
Well, the Jedi Knight issues were solved by running it with -displayconfig option and selecting Matrox instead of Voodoo 2. So indeed it seems like my V2 SLI has problems with non-Glide games. 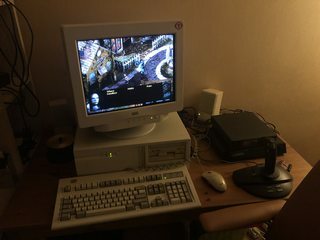 Of course I can always switch my setup for Voodoo 5 and get pretty much the best Glide experience combined with a decent DirectX performance for late 90s and 32-bit color support, but for now I wish to investigate further. 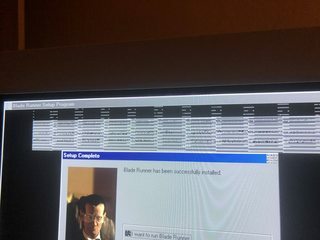 Found out an interesting thing about Supermicro 440BX boards today. Apparently, they are capable of running at 133 MHz, even though it's not mentioned in the manual and it's not done via jumpers. The way to do it is to find "mode 5" factory setting in the BIOS settings. Source. I found the setting, but haven't tested it yet (and not sure that I need it). I wonder what it does to PCI and AGP frequencies. 440BX boards set AGP to 2/3 when run at 100MHz, so at 133MHz it's probably going to be the usual 89MHz, but what about PCI? Asus boards usually had a setting for PCI bus frequency, but Supermicro doesn't have one. First of all, congratulations for your nice rig because it seems like you had a great time bringing it to life. Your setup would probably work just fine with the 44.3 mhz bus, in case the board doesn't support the 1/4 divider. 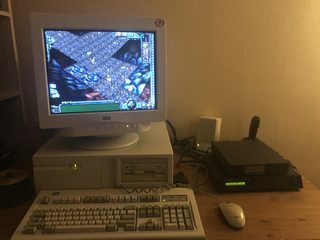 Heck, my Pentium 3 system (ASUS P3BF+1400s) which is as much card-congested as yours, even has a SCSI setup and can easily tolerate the additional speed on the PCI bus. In fact, sequential file transfers benefit noticeably from it. So yeah, after a bit of tweaking I came to a conclusion that I prefer Voodoo 5 AGP over the GF2 GTS + V2 SLI setup. I realise that GF2 has quite a lead over V5 in terms of performance — it gives 30FPS more in Quake 3, for instance. However, it's a difference between 70 and 100FPS, and for the games where GF2 would really shine, I'd probably need a faster system overall. However, the dual (actually triple) GPU setup gives a bunch of compatibility issues. Besides, many games are simply not designed for multi-GPU setups, which was a surprise to me, given the fact that a setup of a V2 coupled with another 3D-capable GPU wasn't unheard of. Also added a second HDD. I have 40+80GB now.